How to Have the Life You Want Now! 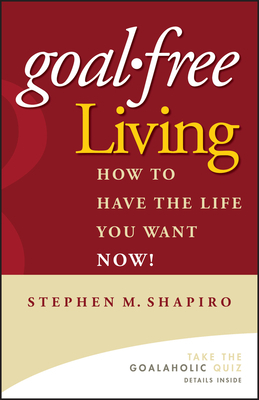 "If you have only one goal this year, let it be this: Read Goal-Free Living "
"Stephen Shapiro's approach will help readers achieve the best kind of happenstance: taking a stance to make things happen." "I have a sense that reading this book may turn out to be one of the most important things I've done in a long time." "This is an engaging, creative approach to discovering inner wisdom and personal fulfillment." "Reading Goal-Free Living is like jettisoning a hundred-pound pack. Suddenly, you're racing much faster and enjoying the breeze." --Alan Weiss, PhD author, Million Dollar Consulting. STEPHEN M. SHAPIRO is a recognized expert and professional speaker on the topics of creativity and innovation. He is the founder of the 24/7 Innovation Group, a management education and research organization focused on innovation and breakthrough business thinking. A former consultant at Accenture, he founded that firm's Process Excellence Practice. You can learn more about goalfree living at www.goalfree.com.